The Travelin' McCourys will be the headlining act of this year's festival and will perform on Saturday, May 19 at 8:00 p.m. The group features Ronnie (mandolin) and Rob McCoury (banjo), sons of Del McCoury, a popular bluegrass legend. Two additional band members include Jason Carter (fiddle) and Alan Bartram (bassist), forming a powerful group playing both traditional and progressive music. The lineup also features award winning Michael Cleveland & Flamekeeper, Jimbo Whaley & Greenbrier, Jerry Butler & The Blu-J's, Ken Mellons, Mountain Ruckus, Just Us, The Quebe Sisters Band, and Rockin' Acoustic Circus who will be filling the stage for two great days of bluegrass music. "This is always an exciting time of the year for us as we finalize our lineup and begin final preparations for the festival," says Sevierville Chamber of Commerce marketing director Amanda Marr. "The talent level of this group of performers is amazing, and they will certainly provide a full weekend of great entertainment for everyone in attendance." Bloomin' BBQ & Bluegrass is proud to present the Hard Rock Cafe Community Stage, an exciting live music venue where you can hear up-and-coming performers of all musical genres. In addition, meet fun characters – like Sevierville's iconic Dolly statue and more as you enjoy the event. Bloomin' BBQ & Bluegrass weekend will also feature a play about Sevierville's history called “Heartstrings” performed by the Sevierville Intermediate School Drama Club. Finally, there will be plenty of interactive opportunities to win prizes, connect with your favorite bands and more. 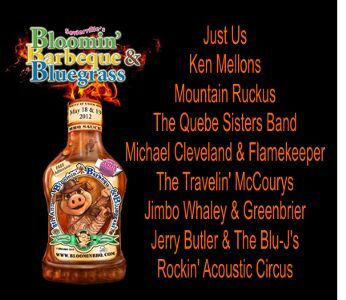 For ticket information, or general information on this year's festival, please visit bloominbbq.com.